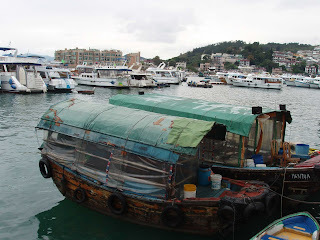 We at Explore Sai Kung were thrilled to see such great coverage of our very special part of HK. However, after this was first published, we actually had a contest to see who could spot the most number of mistakes. DUKE HOTEL? I'm afraid one of the biggest problems that we have in SK is that there is no hotel. 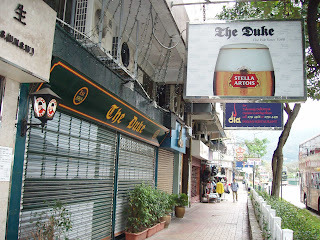 The Duke is a pub/bar - only. I do hope that tourists don't come out here with their suitcases expecting a place to stay (although we do have a youth hostel that isn't too far from public transit). "Tranquil little fishing village outside" - this is a great picture of what Sai Kung was up to the 70s but ...the fishermen have been forced to change with the times and most who are left in their boats are ferrying people to and from the islands. Shark for sale in SK? Not a chance - there are too many of us here who would lynch any restaurant owner who tried to hawk shark on the waterfront. Sai Kung is still a beautiful place that has retained much of the South China "old world" feel, while also catering to the new breed of residents (not only expats but local Chinese who have lived abroad and treasure the green hills and spaciousness compared to the crwods and hustle and bustle of HK Island and Kowloon). Most definitely - HK IS MUCH more than just shopping and we're please that such a story was written (regardless of the inaccuracies).